Congratulations, you've finished the marathon! Now what? Complete marathon recovery can take anywhere from several weeks to several months, depending on the intensity of your race performance and your race-day recovery strategy. Truth is, post-marathon recovery is inevitable, but the speed at which you recover can be drastically improved by following a few simple post-race tricks. 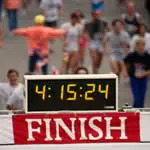 Marathon recovery begins the minute you cross the finish line. Keep walking at least 10 minutes after you cross the finish line to allow your body to return to its resting state gradually. Get your medal, take your photos, pick up your gear and keep walking. It will allow your heart rate and blood flow to return to its normal state as well as reduce the risk of blood pooling in your legs which can cause fainting. Get up and walk around 10 to 15 minutes every few hours for the rest of the day. Refuel depleted muscles as soon as possible with a meal that includes carbohydrates, protein and sodium. Fuel is most efficiently absorbed in the first 30 to 60 minutes post-race. A peanut butter and jelly sandwich, banana and sports drink is one example. If you struggle with eating post-race, try a liquid recovery drink. Recovery drinks are formulated with everything you need to refuel your body—carbohydrates, protein, electrolytes and fluid. A good ole can of V-8 or chocolate milk works well, too. Sip fluids throughout the day to replenish fluid losses. Monitor your urine for adequate hydration levels. If your urine is pale yellow like lemonade you are adequately hydrated. If it runs dark, continue to hydrate. If it is clear, hold off on fluids as you may be over hydrating. Continue to replenish fuel and electrolytes (sodium, potassium) by eating small, frequent meals throughout the day. Schedule a massage two or more hours post-race. Massages too soon to finishing the race can create more soreness. Massage can have a dramatic effect on post-marathon recovery times, and they are a wonderful reward for finishing a long season of training and all 26.2 miles. You can also perform your own massage with some of the products on the market like "the Stick" and foam rollers. They are great for deep tissue massage for hamstrings, calves, thighs and hips. Actively rest with lower impact activities like swimming, cycling and yoga for seven to ten days post-marathon. Give your body and mind a full week off the demands of running, and it will reward you with an efficient recovery. Running too much, too soon post-marathon is the quickest way to an injury. Follow a reverse taper when returning to your running regimen. That is, start with a few 30- to 40-minute easy paced runs and test the waters. If things feel good, gradually increase the duration and frequency of the runs. Keep the running intensity easy for at least three weeks post-marathon. And most importantly—listen to your body. If there are lingering aches and pains, consider taking a few more active rest days and let things heal completely. Sign up for your next marathon.